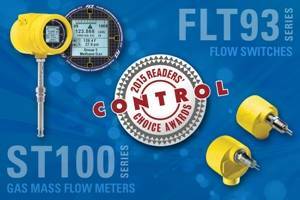 Readers of Control Magazine have selected Fluid Components International (FCI) as the #1 supplier of both Thermal Mass Flow Meters and Flow Switches, an honour that has been bestowed on the company for almost two consecutive decades. In many of the world’s most demanding environments for flow instrumentation, FCI’s products are requested by name. They are recognized for their precision measurement accuracy and repeatability in harsh conditions, where their high performance ensures both end-product quality and operational safety. The company offers a broad range of application solutions from off-the-shelf devices to custom-engineered systems. FCI’s flow meters feature advanced thermal dispersion mass flow sensors. They combine precision flow measurement accuracy with a rugged design that is compatible with caustic, corrosive, humid and high temperature environments. They are highly reliable, easy to install, require virtually no maintenance and are designed for long-life. FCI’s innovative ST100 Flow Meter is an all-new, thermal dispersion technology gas flow meter. The ST100 meter combines the most feature- and function- rich electronics with the industry’s most advanced flow sensors to achieve a truly state-of-the-science flow metering solution for industrial processes and plant applications. FCI flow switches are ideal for a wide range of point-level process applications, featuring an advanced, no-moving parts thermal dispersion flow sensor. Their versatile design also allows them to measure flow or level or temperature. The company’s NuTec® flow switch utilizes a unique non-contacting flow element that separates the sensor from the process media. FCI flow switches are ideal for interface monitoring in mixed density media, such as foams, emulsion layers and slurries. FCI’s FLT93 Series FlexSwitch™ is the process industry’s most advanced heavy-duty thermal dispersion technology flow and level switch in the world. Its multi-parameter measurement design is based on more than 50 years of flow and level switch engineering and application experience, providing a rugged long-life instrument. FCI’s custom designed flow and level sensors for OEM applications are ideal for use in a wide range of industrial equipment where monitoring, high/low alarming, metering, switching and totalizing are required. Ideal for gas or liquid applications, these devices feature advanced micro-electronics for direct mass flow measurement in a rugged, no-moving parts design that offers exceptionally high reliability and long-life. Flow conditioners developed by FCI’s Vortab Company provide a low-pressure loss solution to correcting flow profile irregularities that affect the accuracy of flow instrumentation. In today’s crowded plants, elbows, valves, blowers and other devices in the pipeline can disrupt flowing media, which reduces measurement accuracy. Vortab® flow conditioners eliminate these flow disturbances to ensure accurate data. FCI’s world-class, fully NIST traceable flow calibration laboratories test and calibrate all FCI products to ensure instrument accuracy with the customers’ actual fluid and process conditions. FCI’s calibration laboratories are ISO9001:2008 certified and AS9100 compliant. The laboratories also meet MIL-STD-45662A and ANSI/NCSL-Z-540 requirements. The company’s advanced technologies also include mechanical design, advanced materials, metallurgy, electronics, communications and more. Webinar – Take The Guesswork out of Measuring Solids!